Trick or Treat! Halloween events in Manila abound when October sets in! 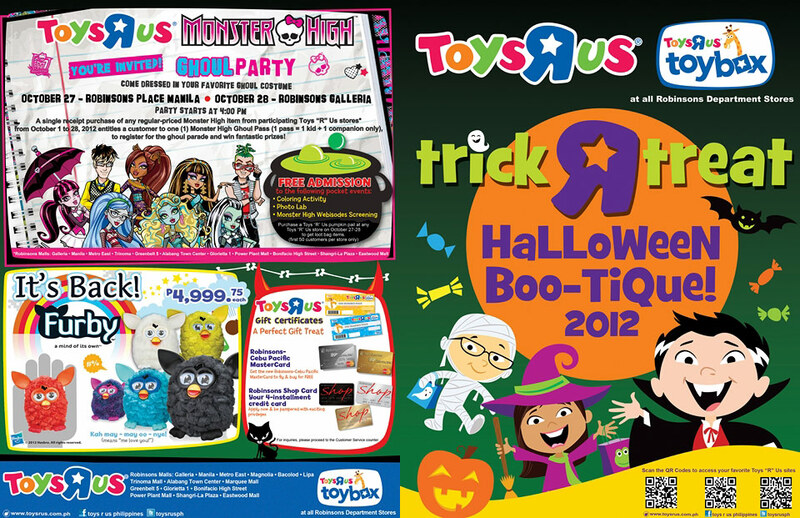 As parents, we go gaga over the Halloween season by buying or having made-to-order costumes for our kids in time for numerous Trick or Treat events in the metro. 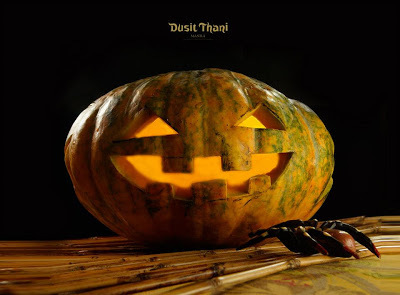 I am one with you who want to prepare ahead of time and just simply make sure kids have a grand time wearing their cute or scary costumes adorably and getting overflowing loots in their pumpkin pails. 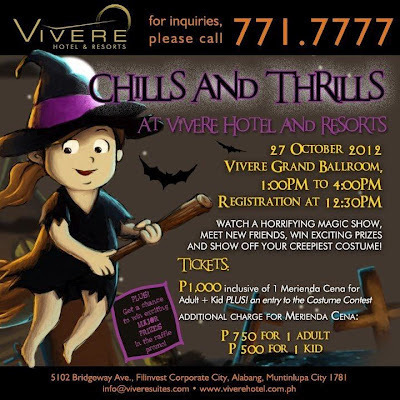 Tickets available at P700 for 1 kid & an adult/companion inclusive of merienda buffet. 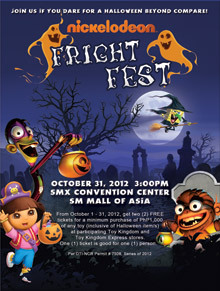 Halloween-themed game-booths, arts and crafts activities and special loot bags. 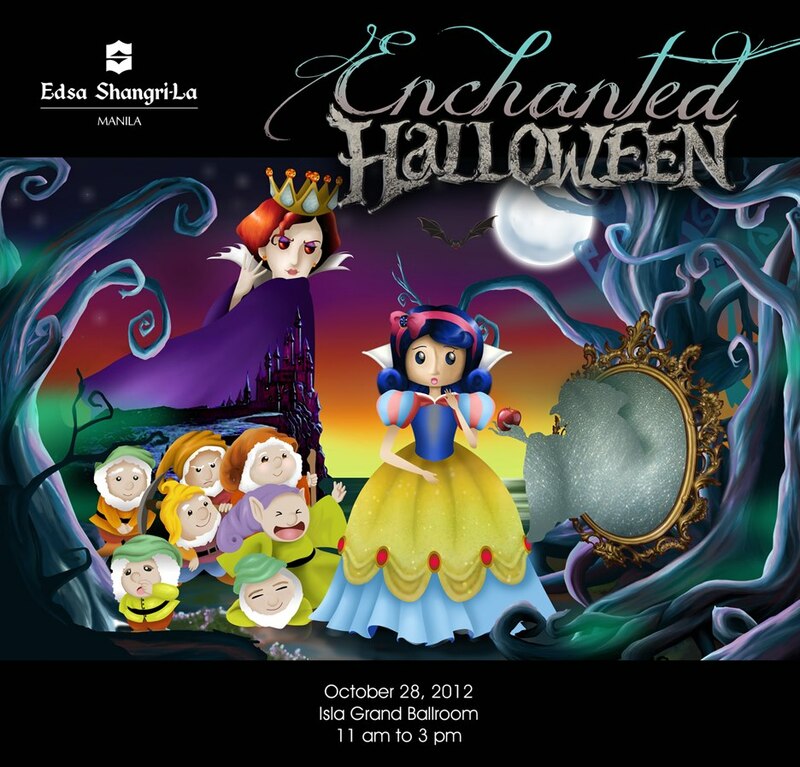 October 31, 2012, 2:00-4:00 p.m, Dusit Thani Hotel, Grand Ballroom. Tickets at PHP 850 nett/person, inclusive of: activities, giveaways, and a merienda buffet. Visit their website and their Facebook page for more details. 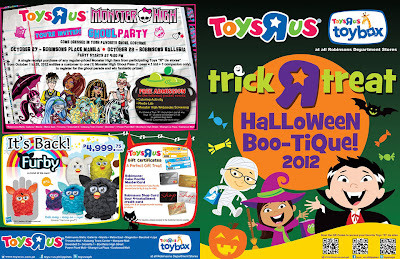 (inclusive of halloween item/s) at participating Toy Kingdon and Toy Kingdom Express stores. at Toy Kingdom for a ticket to the haunt. 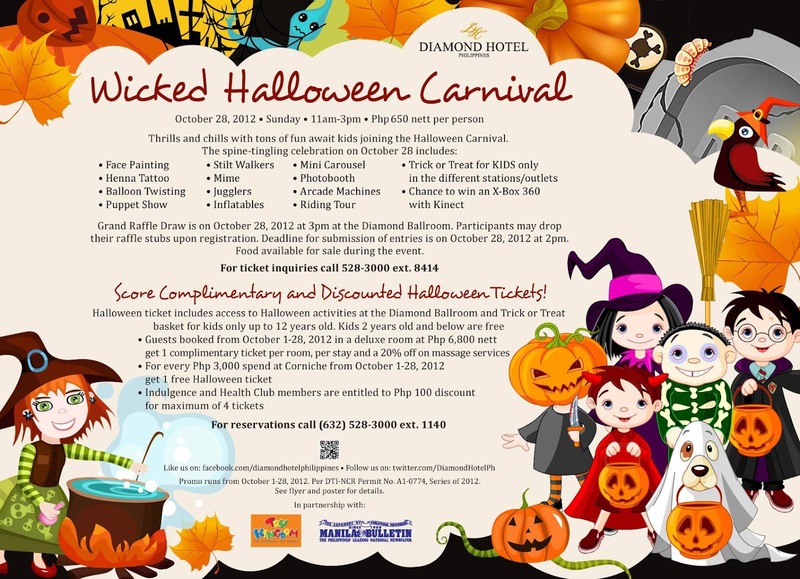 during promotional period only ( from sept.29 to 11am Oct. 27, 2012). 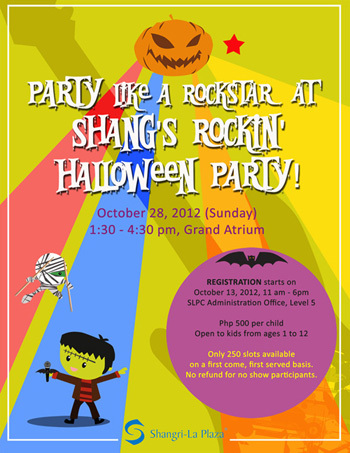 which entitles to register for the costume parade and win fang-tastic prizes. food & drinks. 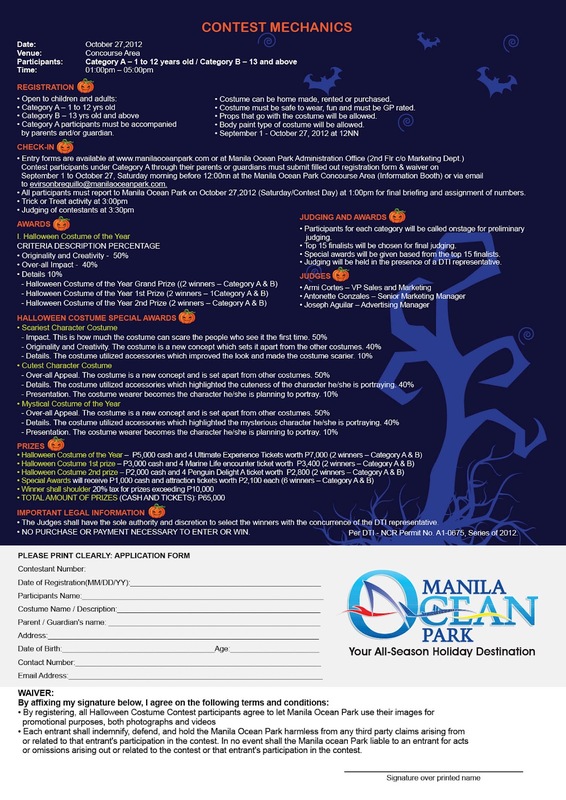 Call (632) 404-9995 for inquiries and more details. 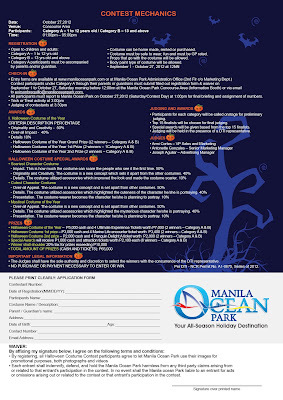 More information at Manila Ocean Park's website. 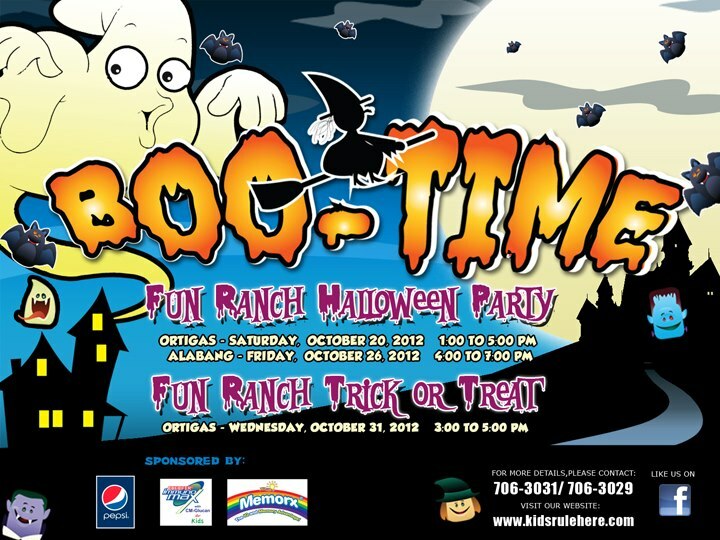 Visit Fun Ranch's Facebook Page or website for more details. Register early and arrive on time to avoid rushing and to ensure your child's slot in the activity. Some events have limited slots. Always accompany your younger child during Trick or Treating. If older kids don't want to be accompanied anymore, make sure you set a meeting time and place. Arrive ahead of time on your agreed meeting time and place with older kids. Choose costumes that are made of light fabric or something breathable to avoid sweating too much. Trick or Treat activities could be tiring for the children too. Whether done indoor or outdoor, apply insect-repellent lotions on your kids. Always bring sweat towels, fan and extra clothes. Never forget to bring water to avoid dehydration. 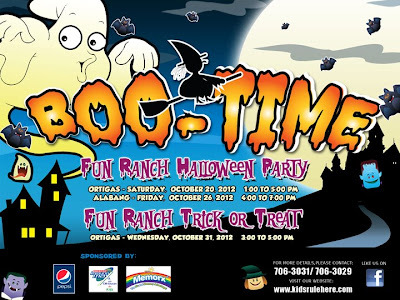 Bring bigger reusable bags to put your children's treats in case their pumpkin pail gets filled up. We don't want them to carry a heavy load. If event happens to be in the evening, have your children wear something with lights, glow in the dark bracelets or make them bring a small flashlight, to be visible at night. Don't let your children eat the treats without inspecting them. Unwrapped goodies should be discarded right away. Just bring food such as cookies or pastries, in case they become hungry during the activity. 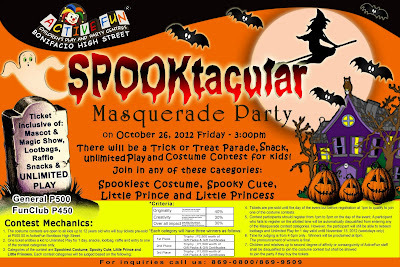 It is sad that we did not have any trick-or-treats in Zamboanga City when he was younger so when he sometimes sees this in SM, he felt shy to join in! 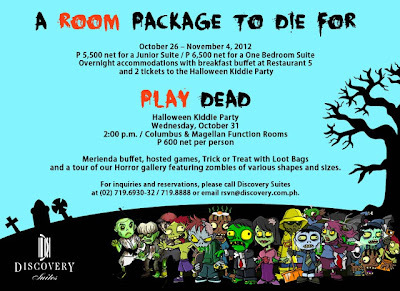 I remember that I have a friend who joins in these kind of events :) Visiting from CommEx Oct2. 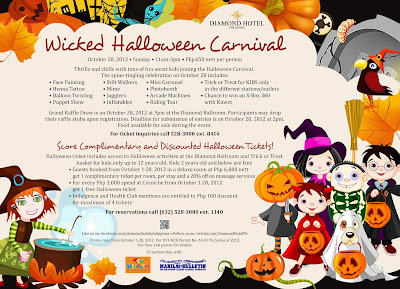 Whao..so many Halloween events that one can attend. We will not be going to any this year as the kids are still too young. 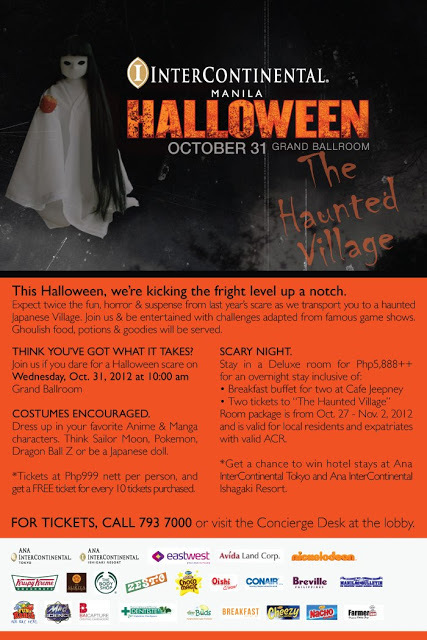 oh, i remember my cousins and i were at the ocean park last halloween...i wonder saan kaya kami this year? Spooky month again. Thanks for the share! 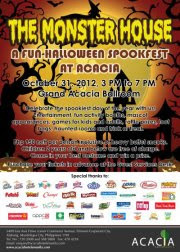 Exciting info ..now its ber mOnths it's hallowen party aGain..! awOOhh..
same here sis! That's why I let my kids experience Trick or Treating! :) Thanks Roselyn! I think SM Cebu has Lalah! Go ahead and share! :) Thanks Abbey. halloween is coming to town. hahaha. a nice treat for children and a long vacation for us to enjoy. 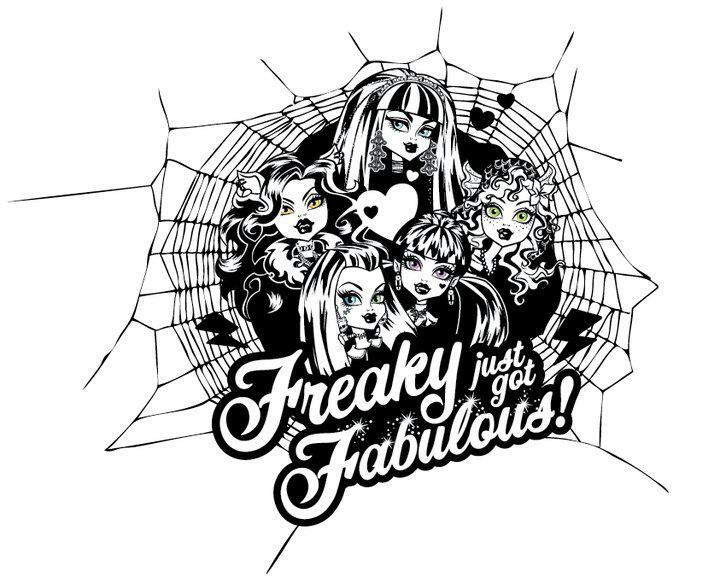 October's here! 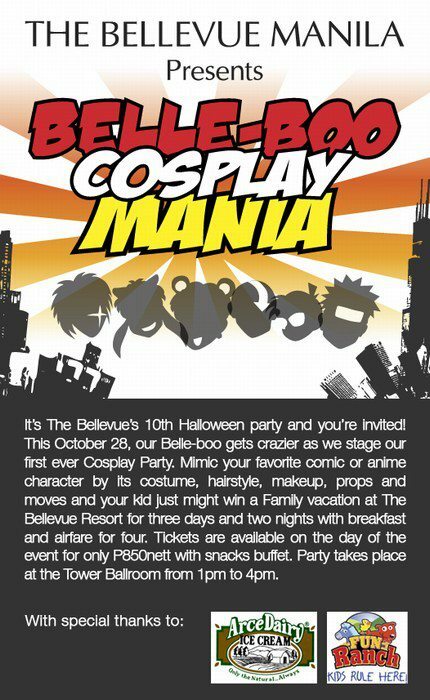 I've never experienced trick or treat before, but I always anticipate that time of the year. It's always fun to watch horror movies, and to see kids dressed-up. Thanks for sharing this, btw. I might try to experience it for the first time. Lucky Manila, you do have a lot of options where to go for the Halloween events. 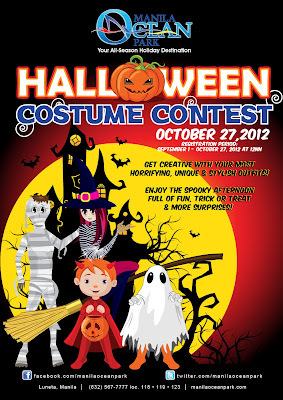 Maybe here in my town, they will hold a costume contest. In the family, my cousin and I are planning to throw our own trick or treat party...for the sake of the kids and of the season. I'm now following through GFC. :) Thanks! wow that's a lot of events! thats the perks of being in the Metro. :( sad im from the province. thanks for this! How about powerplant mall? 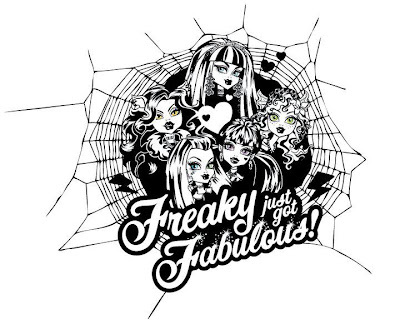 what's their halloween event? hey dear, the information posted for eastwood was for last year. eastwood has not posted any event for this year as of today, thanks! I will keep myself updated and post it here. :) Thanks. aaww.. I'm sure an SM mall would have something for the Halloween? 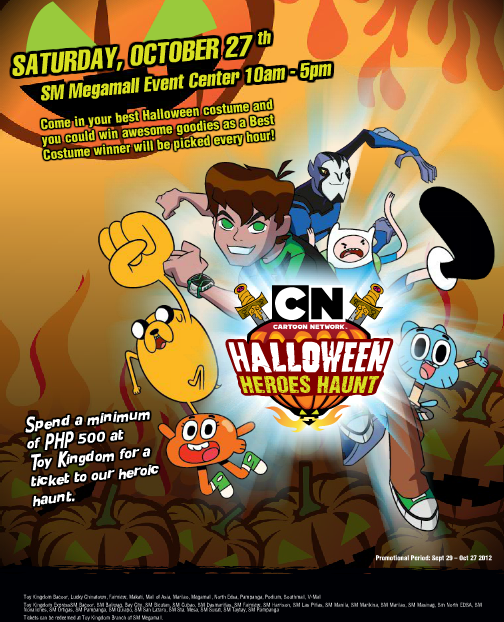 When I was a kid we usually go to SM southmall to have a trick or treat inside the mall, i mean all over inside the mall. 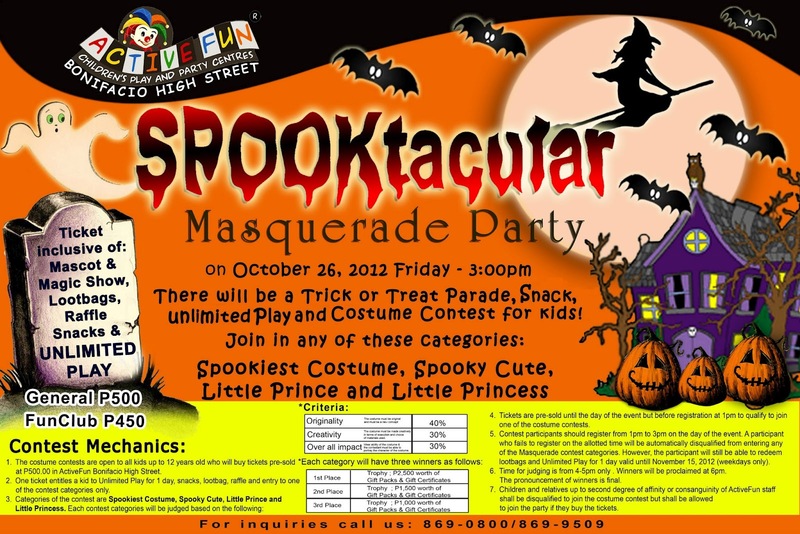 We didn't attended any event because we cannot afford, every store/bank/foodchains gave candies or freebies that made my pumpkin basket full, my question is where can I find again this kind of holoween activity for my child ??? thanks! That is so true mommy that's why I wrote this post for moms like myself who doesn't really know where to bring their kids for the Halloween. At least now we have a lot of options. sis, wla bng free lng?ung d kelngn mg purchase?m0a or mkti area?